Get your disgustingly blurry standard 4K out of LG's face - it's just announced its massive 105-inch curved TV, which pushes the game up to 5K, is now available to buy. The beast of a television was first revealed back at CES this year, with its CinemaScope 21:9 aspect ratio and mammoth 4K-beating 5120 x 2160 resolution. Integrated 7.2 channel speakers are also included in the set, and with LG's webOS you'll be getting a smart TV that's a bit more intelligent that most. But at 120 million won (around $117,000, £68,960, AU$124,530) you won't be spotting this in the bargain basement. You will, however, probably need to rent out your own basement to afford it. Still interested? 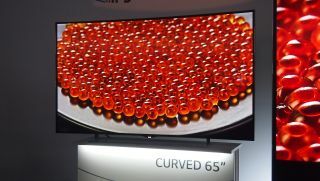 Unfortunately LG's TV is only for sale in Korea right now but LG tells us that the curvy screen will be rolled out in other markets "from the fourth quarter" with prices to be announced locally.